The Indoor Bamboo Blinds are being increasingly used by people who want to make their windows look different. These can really make a dull looking room liven up with warmth. 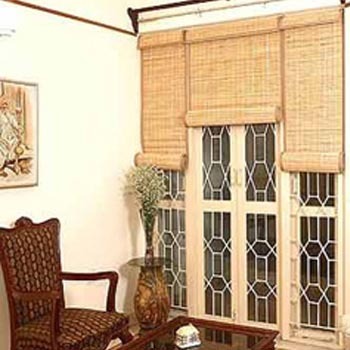 The main advantage of the bamboo blinds is that they can be maintained and cleaned easily. One requires a furniture polish and clean cloth for this purpose. If they are maintained properly they can last for a long time. Overall, these blinds make a room look more soothing and relaxed. The bamboo blinds are designed to bring the natural beauty of wood into your home or into your office. These window blinds are made to measurement from quality timbers. We use reed bamboo to manufacture all products. This eco friendly fibre is versatile, durable and incredibly strong and therefore ideally suited for our purpose. The bamboo is dried thoroughly before we put it to use to give improved finish and added luster to the product. It also helps to prevent fungal growth to which bamboo is otherwise susceptible. A modern gas fired drying kiln is utilized to achieve complete drying. In case of Bamboo weaves, the bamboo is then subjected to a further chemical treatment process to augment durability and anti fungal properties. All our Woven products go though this process.